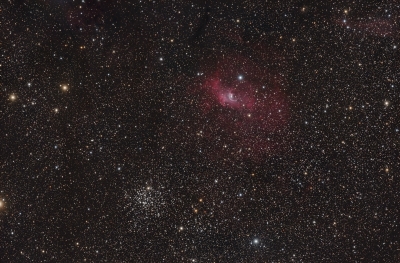 This is a very interesting region located in Cassiopeia constellation with a lot of HII emission nebula and with two major astrophoto objects of interest: NGC7635 and M52. NGC7635 also called "Bubble nebula" (Sharpless 162, Caldwell 11) is an emission nebula with a very particular "bubble" shape (with a size from 6 to 10 light years), created by the stellar wind of a central star (SAO 20575 (BD+60 2522). NGC7635 was discovered by William Herschell in 1787 and its distance ranges between 7100 and 11000 light years, according to different sources. M52, also known as NGC7654, is an open cluster formed by near 200 stars that was discovered by Charles Messier in 1774. The distance of the cluster is also uncertain and different studies estimate it between 3000 and 7000 light years. Bottom image is a pure RGB composition with near 14 hours of accumulated exposure. 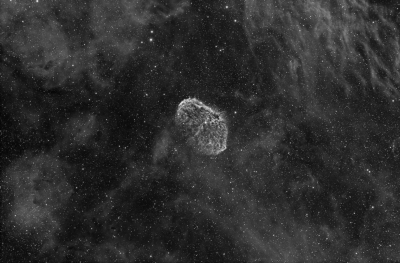 Center image has been taken through an Astrodon Hydrogen alpha filter (6 nm) and has an accumulated exposure of 8 hours. Top image is a personal view (or combination) of the two previous images. 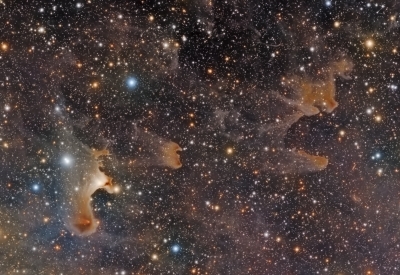 The combination of the (linear) RGB and Halpha images has been done using the "HaRGB Combination Script" in PixInsight. This tool allows the user to easily select the degree of presence or intensity of the Halpha in the final image. As this field is clearly dominated by Hydrogen alpha nebulosity and I had a reasonably good (low noise) Halpha image, I decided to put a strong contribution of it in the final image. I recognize, however, that someone may think that the result on the final image is somewhat exaggerated. Complete exposure details, full resolution and close up versions of NGC7635 on the three images are available in Gallery section. 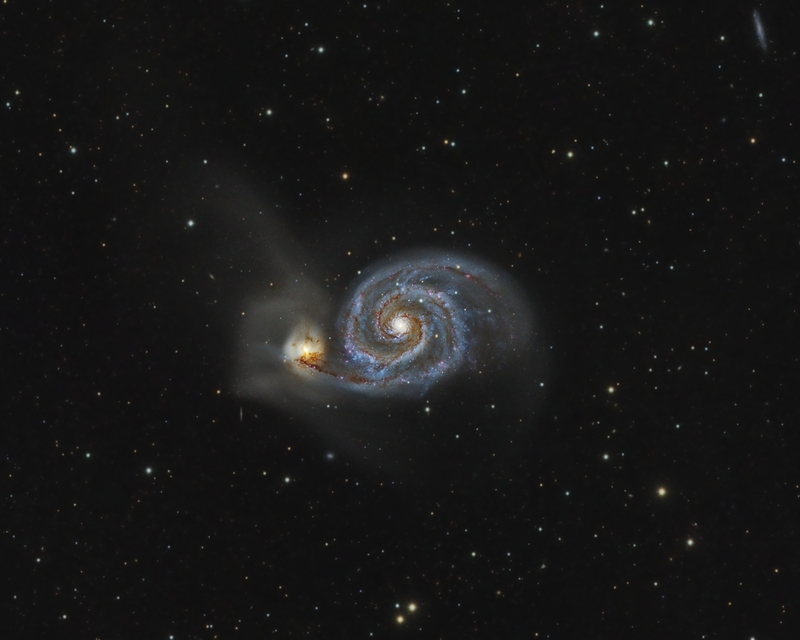 Images were acquired with CCDCommander (CCDSoft, The Sky & FocusMax) and entirely processed with PixInsight. 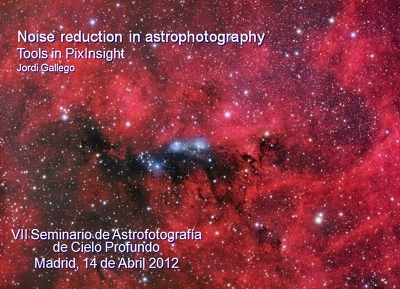 Conference describing tools and strategies for noise reduction in astronomical images with PixInsight. PowerPoint files with conference slides both in English and in Spanish (17 Mb) are available for download in the Articles section. 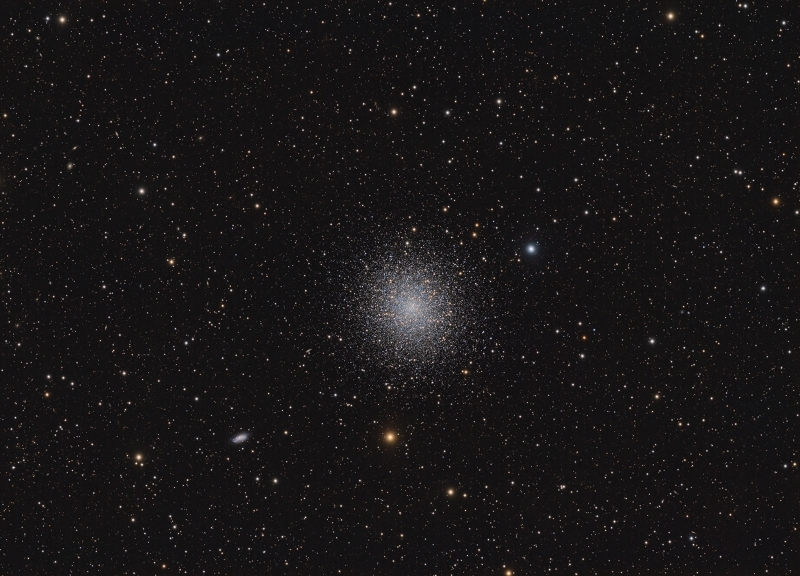 M13 is a globular cluster of about 300.000 stars, discovered by Edmond Halley in 1714, and located in Hercules constellation. M13 is about 25.100 light years away form earth and has a diameter of 145 light years. 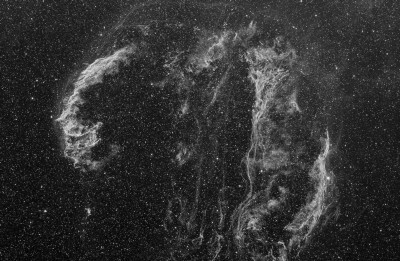 The image is a pure RGB composition (TOA-150 & STL-11k) with 16 hours of accumulated exposure. Complete exposure details, and a higher resolution and widefield versions are available in Gallery section. 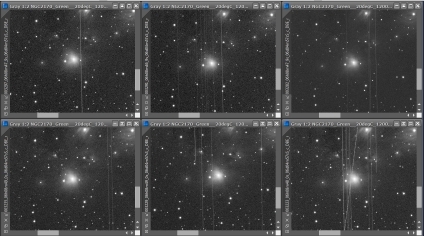 Bottom image on the right is a plate-solved version of the full widefield covered by the camera generated with the "Image Plate Sover" and "Annotate Image" scripts of PixInsight. Images acquired with CCDCommander (CCDSoft, The Sky & FocusMax) and entirely processed with PixInsight. We have mapped and analyzed a stellar stream in the halo of the nearby dwarf starburst galaxy NGC 4449, detecting it in deep integrated-light images using the Black Bird II Observatory 0.5-meter telescope, and resolving it into a river of individual red giant branch stars using the 8.2-meter Subaru/Suprime-Cam (NAOJ). 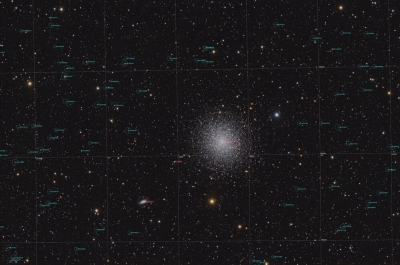 The properties of the stream imply a massive dwarf spheroidal progenitor, which will continue to disrupt and deposit an amount of stellar mass that is comparable to the existing stellar halo of the main galaxy. The ratio between luminosity or stellar-mass between the two galaxies is near 1:50, while the dynamical mass-ratio when including dark matter may be between 1:10 and 1:5. This system thus represent a "stealth" merger, where an infalling satellite galaxy is nearly undetectable by conventional means, yet has a substantial dynamical influence on its host galaxy. This singular discovery also suggests that satellite accretion can play a significant role in building up the stellar halos of low-mass galaxies, and possibly in triggering their starbursts. A paper describing the research work has been submitted and accepted for publication at Astronomy & Astrophysics journal. Dcumentation on PDF format is available for download in the Articles section. 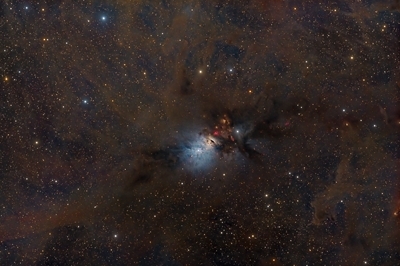 Top image, which was used in preliminary research work, is a deep widefield (1.69 "/pixel scale) LRGB image taken in 2010 with TOA-150 telescope and STL-11000M camera (with an accumulated exposure of 3 hours) from Fosca Nit Observatory. Complete exposure details and a full resolution version can be seen in Gallery section. Second image is an inverted luminance version of previous image, more clearly showing tidal stream. These images were acquired with CCDCommander (CCDSoft, The Sky & FocusMax) and entirely processed with PixInsight. Third image which has been the base of the scientific work, is a very deep and detailed image (0.46 "/pixel scale) of NGC4449 and tidal stream, taken by R. Jay Gabany with Ritchey-Chretien 0.5 meter f/8.3 telescope and U16M CCD camera at Blackbird Observatories. 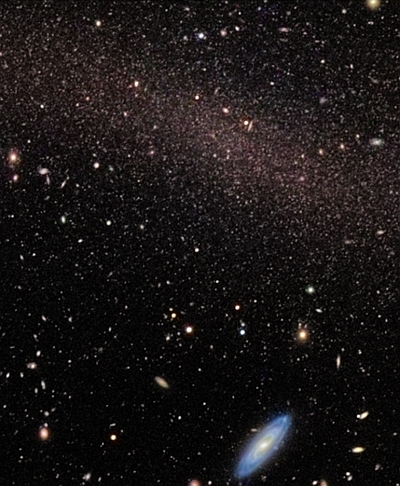 This extremely high quality image gives a lot of galaxy detail and clearly shows tidal stream. Image is copyright © by R. Jay Gabany and is shown here by permission from the author. Complete exposure details and a higher resolution version is available in author's website. Bottom image is a close up view (0.202 "/pixel scale) of image taken by 8.2 meter Subaru telescope (NAOJ) which resolves the stream into its constituent stars. Complete information on this superb image, that includes color data acquired from Blackbird Observatories and that has been entirely processed by R. Jay Gabany, is available in author's website. 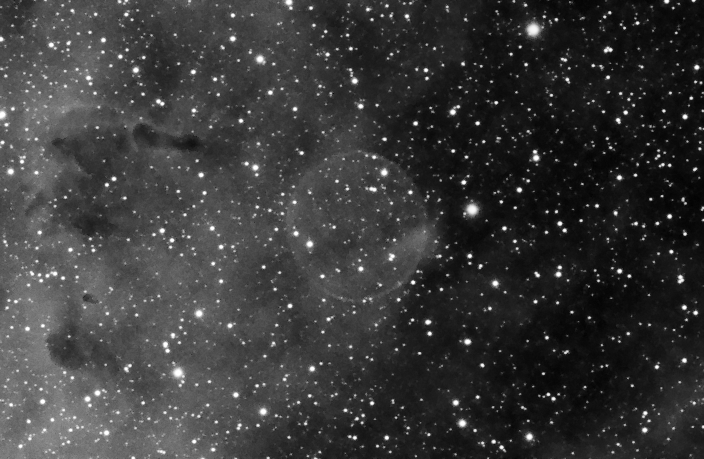 Sharpless 82 (Sh2-82) is a small emission nebula surrounded by a reflection nebula (LBN29) in Sagitta constellation. 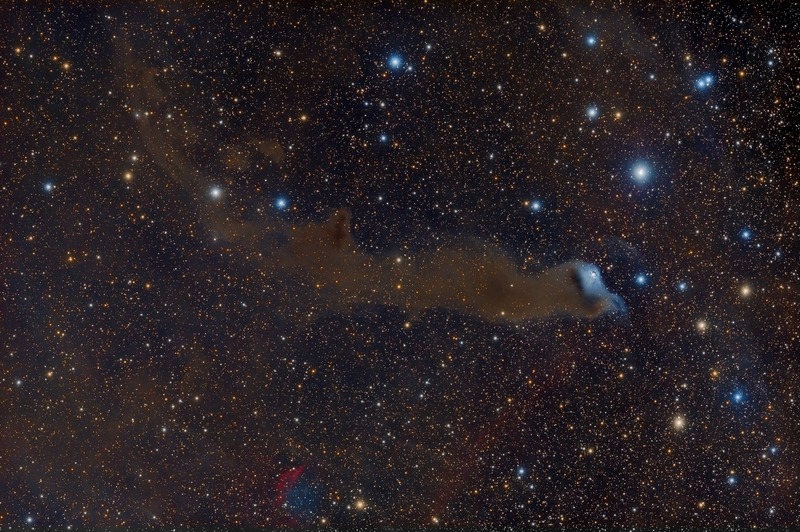 The two nebulas are located in the middle of a dark dust cloud. The whole complex is sometimes referred as "The little Cocoon" or "The little Triffid" nebula. The image is a RGB composition (TOA-150 & STL-11k) with 10 hours of accumulated exposure. 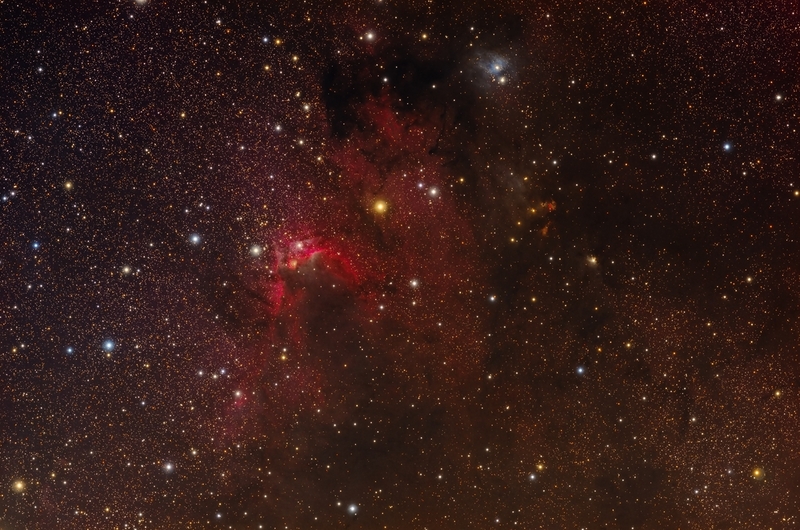 This interesting widefield area shows reflecting nebula NGC6914 surrounded by HII clouds, near IC1318 and Gamma Cygni. 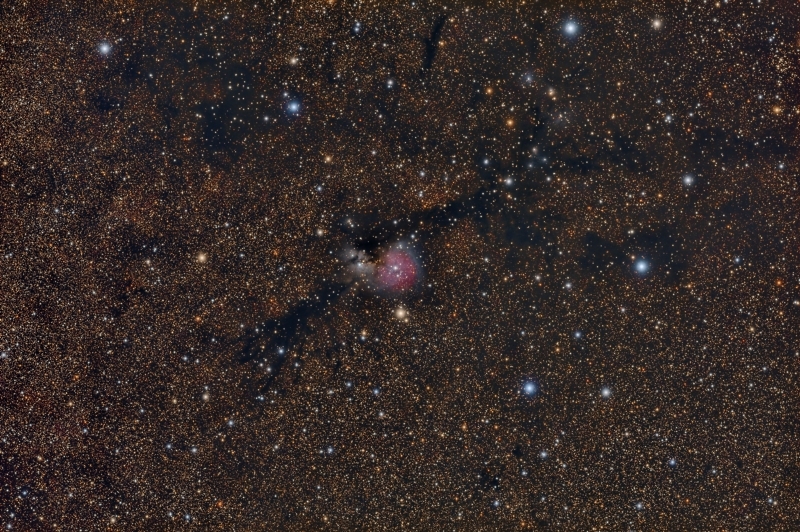 This nebula is catalogued in two separated components, NGC6914A (VdB 131) and NGC6914B (VdB 132). 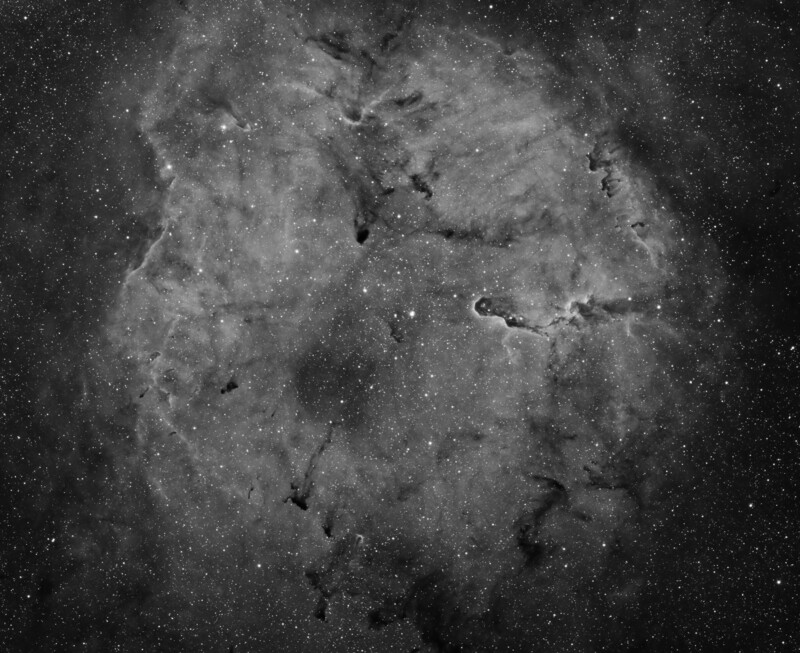 It was a pleasure for me to come back to this area as very near here is where I took, back in 2006, my first image from a dark sky: an image of IC1318, centered in Gamma Cygni. 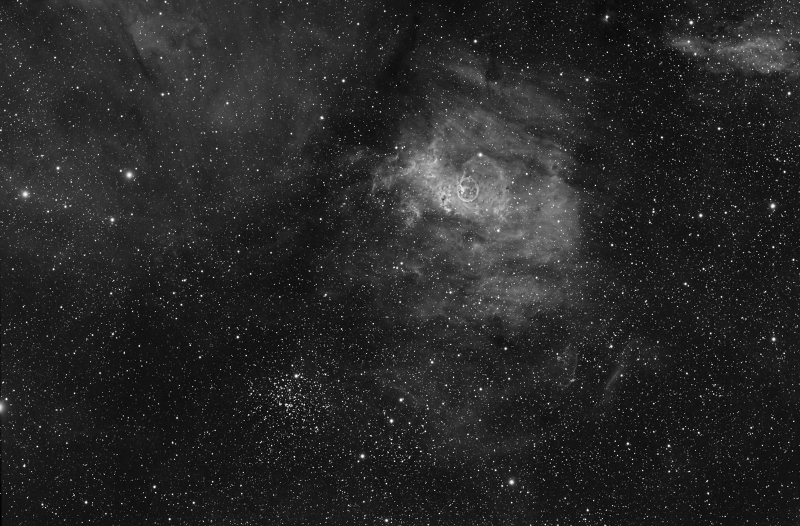 The image is a (R-Halpha)GB composition (TOA-150 & STL-11k) with 14 hours of accumulated exposure. 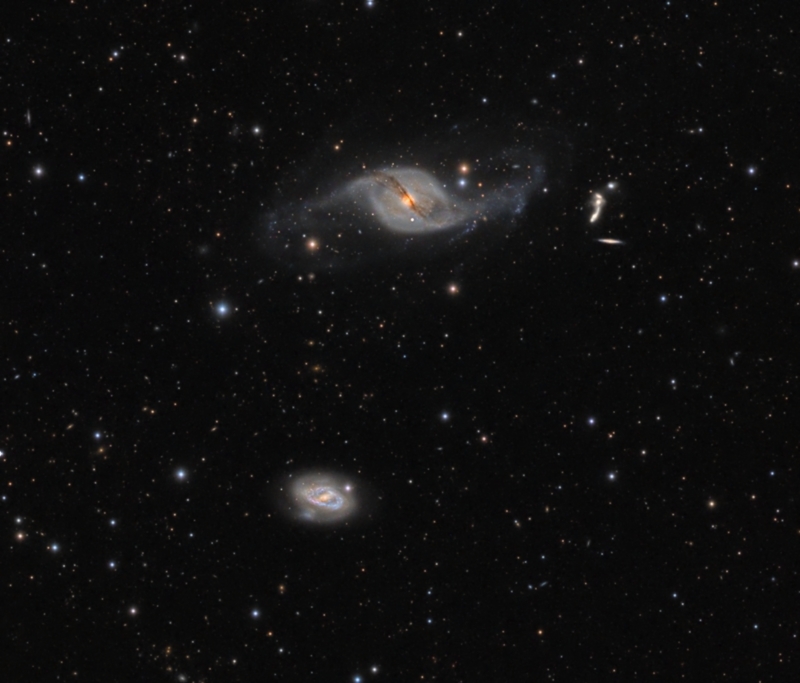 This field includes a number of interesting and peculiar galaxies located at a distance of about 42 million light years: NGC3718, a galaxy with an extraordinary "S" shape, included in the Atlas of peculiar galaxies from Dr. Halton Arp as Arp 214, NGC3729 which seems to orbit at a distance of about 145.000 light years of NGC3718, and which may be responsible of the strange shape of it, and a group of 5 galaxies in the background known as Hickson 56 (and also included in Arp's catalogue as Arp 322). LRGB image (TOA-150 & STL-11k) with 14 hours of accumulated exposure. Complete exposure details, and a higher resolution and widefield version are available in Gallery section. In May 2008 I already imaged this zone (see the first image on the bottom of this page) with FSQ and my new (at this time), CCD camera. 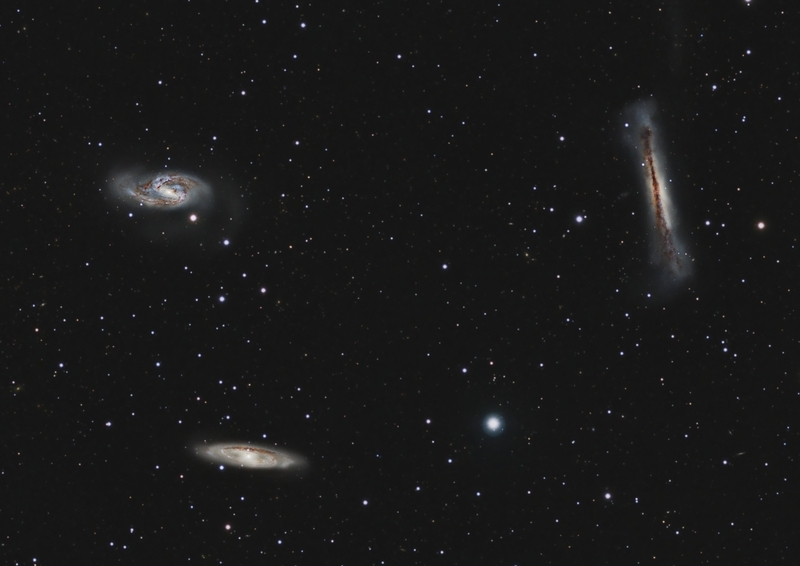 My objective on that picture was to show the Integrated Flux Nebulae, while not burning the galaxies. 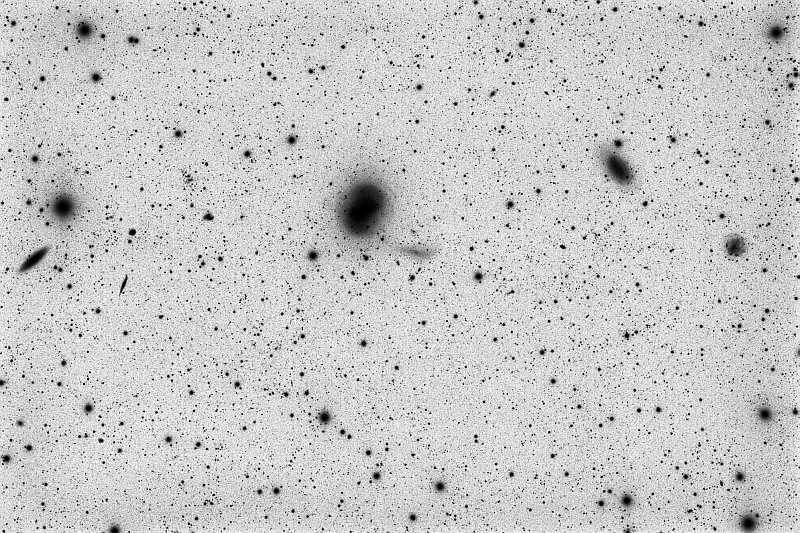 This time, working with the TOA-150 at about double resolution (1.69 "/pixel) than in 2008, the goal was to show up the IFN while capturing detail on the galaxies. I acquired some RGB exposures last year but time passed very quickly and had to move to other targets. This year I have been able to acquire luminance data. I also took a lot of short exposures (1 minute) to be able to make an HDR composition in order to show core detail of M81. Complete exposure details, and a higher resolution version are available in Gallery section. Widefield image of a Monoceros region that includes a lot of interesting objects: specially the beautiful and colorful NGC2170 complex, but also trhee objects from the Van den Bergh catalogue (VdB68, 69 and 74), three more objects from the NGC catalogue (NGC2182, 2183 and 2185) and also LDN1646 and LBN999. This image is a pure RGB composition, with subexposures acquired with TOA-150 and STL-11k between December 2010 and February 2011. The image has been very difficult to process as this zone is a very crowded path of satellite transit: I found that all subexposures have 3 to 7! satellite traces. You can see a few of them (not at all the worst!) on the image on the right. Fortunately, the sigma clipping algorithyms of PixInsight (winsorized sigma clipping on this case) could take care of all of them (more than 200 traces in total!). 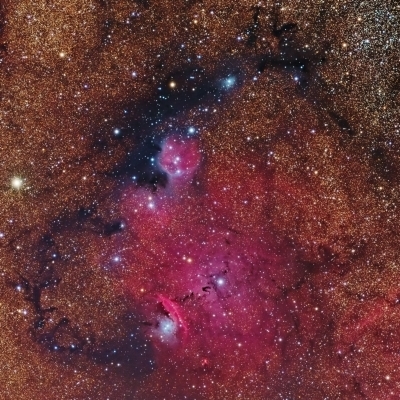 Widefield image of a Perseus region centered in NGC1333, a nebula catalogued as reflection. This is an active star forming region located at a distance of about 1000 light years. This image was planned to be a RGB image, however I started to acquire luminance exposures by mistake, so at the end I produced a LRGB image. Image taken with TOA-150 and STL-11k on between September and November this year. 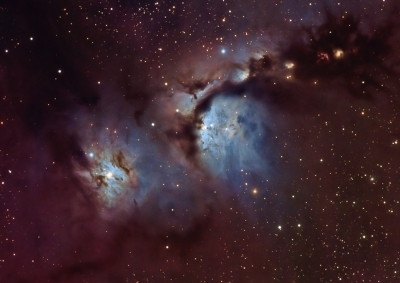 Complete exposure details, a higher resolution version and detail view of NGC1331 are available in Gallery section. 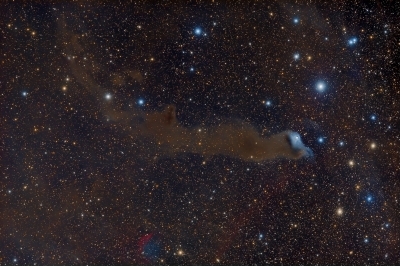 Widefield image of a Cepheus region with special interest in VdB 141 (sometimes referred as Ghost nebula), the reflection nebula on the bottom-left. As in previous image of VdB 152, this time I have also used LRGB strategy (instead of RGB from my previous shots). Image taken with TOA-150 and STL-11k on September this year. 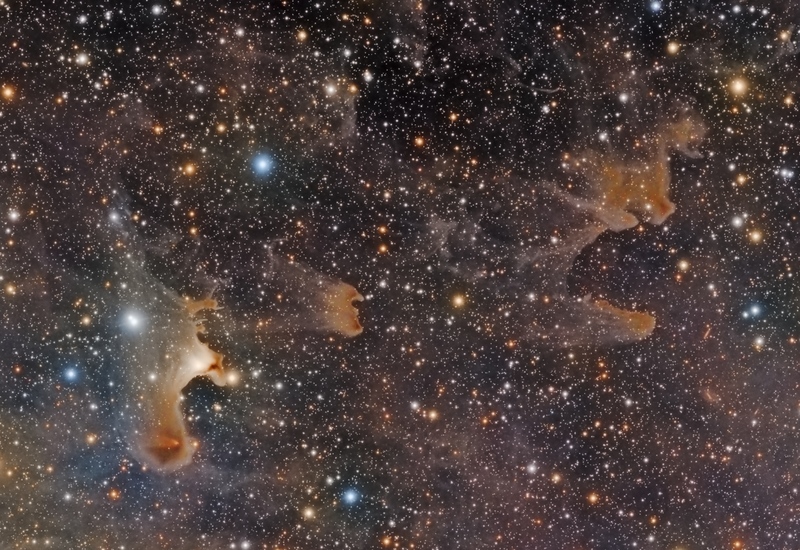 I have used with this image for the first time a new set of Astrodon LRGB I-Series filters. Complete exposure details, a higher resolution version and detail view of VdB141 are available in Gallery section. 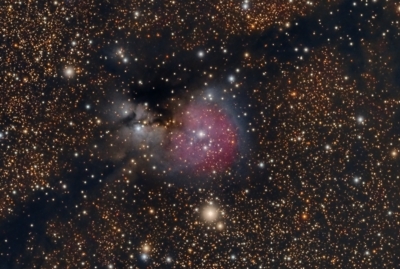 Widefield image of a Cepheus region with special interest in VdB 152 (Cederblad 201), the reflection nebula on the right-center and DeHt5 (PN G111.0+11.6) the planetary nebula on the bottom (a bit on the left), but including many other interesting objects: LBN538, B175, LBN528,.....). As this time target was really faint, I went back to LRGB strategy (instead of RGB from my previous shots), and I must recognize that I am quite happy with the result. Image taken with TOA-150 and STL-11000 on August this year. Complete exposure details, a higher resolution version and detail view of VdB152 and DeHt5 are available in Gallery section. 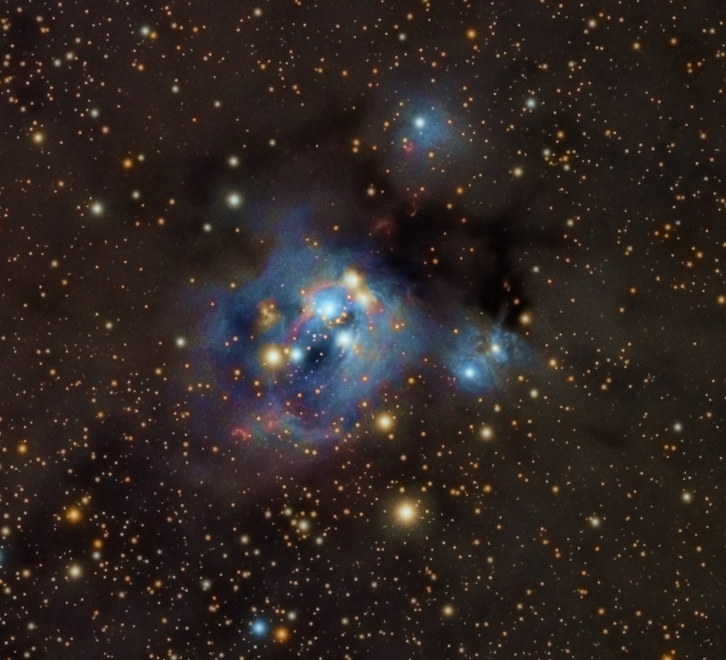 Widefield image of a star forming region in Cepheus with significant dust clouds. 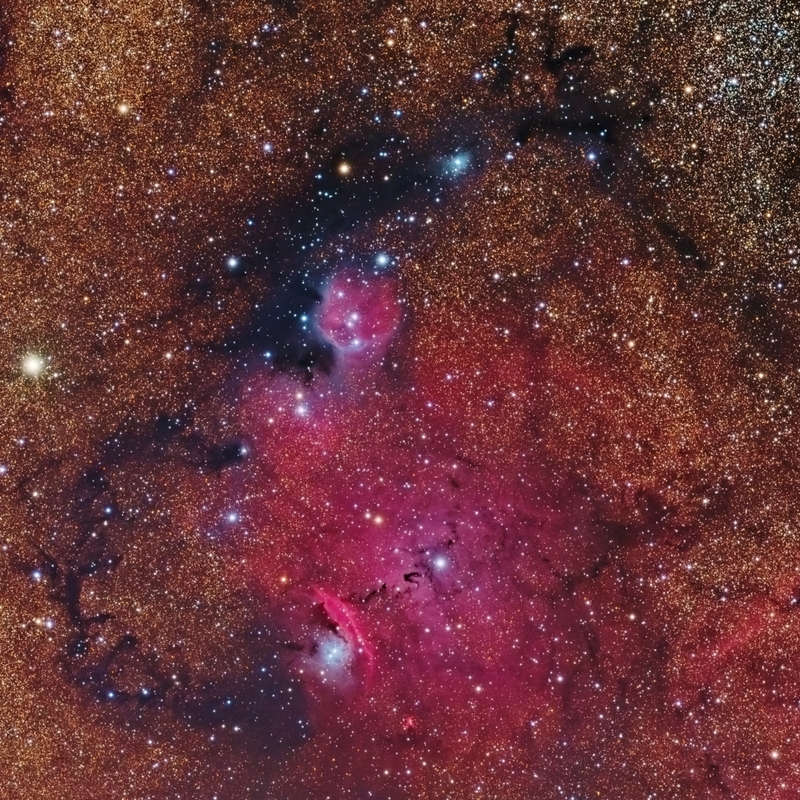 Sh2-155, also known as Cave nebula, is the bright red emission nebula almost in the center of the image, while VdB 155 is the reflection nebula located on the top. Pure RGB image taken with TOA-150 and STL-11000 on July this year. Complete exposure details and a higher resolution version are available in Gallery section. NGC6559 nebula complex is a beautiful collection of nebulosity in Sagittarius. It is located just one degree east of M8, the Lagoon Nebula. 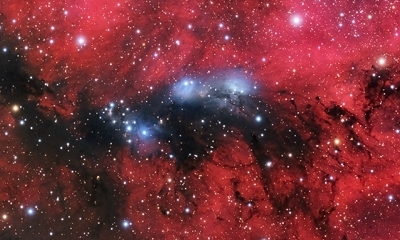 NGC6559 is the brightest patch of emission nebulosity in the image, forming an arc-like structure around a blue reflection nebula (in the lower part of the image). The red emission nebula almost in the middle of the image, which is ringed by blue reflection nebulosity, is designated as IC 1274. 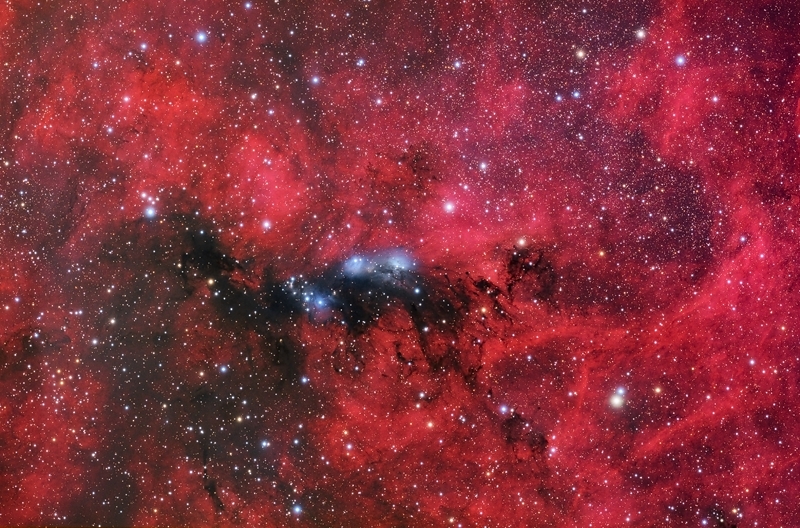 The most prominent dark nebulae, in the bottom-center of the image, is B 303, which can be seen as a dark serpentine structure just on the right of NGC6559. This dusty region, which is probably associated with the brighter and better-known Lagoon and Trifid Nebulae and part of the same molecular cloud, is a starbirth region with many young stars. This is a LRGB image with luminance taken with TOA-150 and STL-11000 on July this year, and RGB data from a previous shot with FSQ-106N. Complete exposure details, the luminance version and a higher resolution version of the RGB image are available in Gallery section. 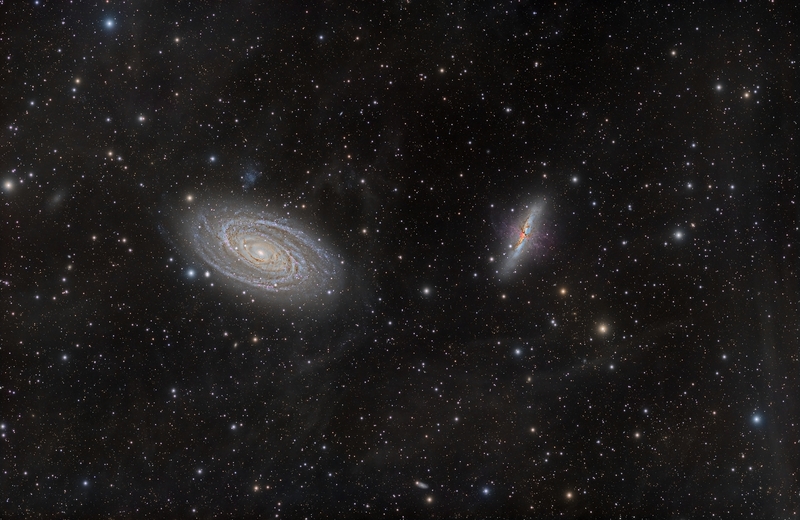 The galaxy M81 (NGC3031) together with its companions, the galaxies M82 (NGC3034), NGC3077 and NGC2976 forms one of the most iconic groups of interacting galaxies. 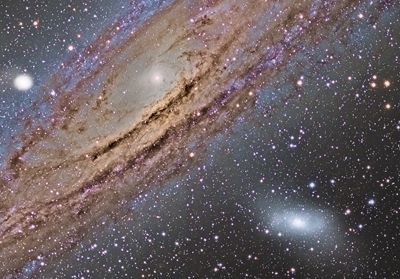 Located at a distance of about 12 million light years from us, the M81 group has been the subject of many studies to analyze evidence of strong interactions among its components. In 1965, Halton Arp detected an unusual ring shaped feature near M81 while examining photographic plates produced with the 48 inch Schmidt camera on Mount Palomar. This optical feature, usually referenced as ”Arp’s loop”, is typically interpreted as a tail resulting from the tidal interaction between M81 and M82. However, since its discovery this interpretation has been doubted by many authors. In fact, the region containing the M81 group of galaxies is filled by Galactic cirrus that cover a large area of the sky, and Arp’s loop exhibits color and emission properties similar to those observed in Galactic cirrus clouds. Our primary purpose was to identify the sources of optical and infrared emission observed in Arp’s loop . The morphology of the Arp’s loop has been investigated with deep wide-field optical images obtained with modest ground based instruments located in dark sky locations. We also measured its colors using IRAS and Spitzer-MIPS infrared images and compared them with images of M81 and Galactic dust cirrus that fills the area of the sky where M81 is located. 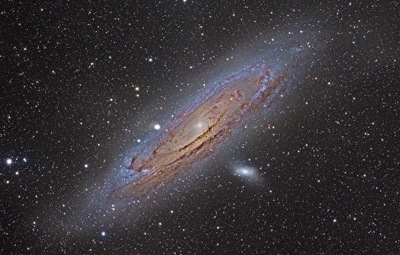 The above results suggest the light observed at optical wavelengths is a combination of emission from i) a few recent star forming regions located close to M81 (NGC3031), where both bright UV complexes and peaks in the HI distribution are found, ii) the extended disk of M81 and iii) scattered light from the same Galactic cirrus that is responsible for the bulk of the far infrared emission. Complete documentation on PDF format is available for download in the Articles section. Bottom image, which was used in the research work and paper, is a deep wide-field LRGB image taken in 2008 with FSQ-106N and STL-11000M (with an accumulated exposure of 12 hours). This image was Astronomy Picture of the Day (APOD) on May 12, 2008. Complete exposure details and a full resolution version can be seen here. Center image has been taken this year (February to April) with TOA-150 and STL-11000M. This image (which is new and was not used in the research work) is a pure RGB image with an accumulated exposure of several hours. Complete exposure details and a full resolution version are available in Gallery section. 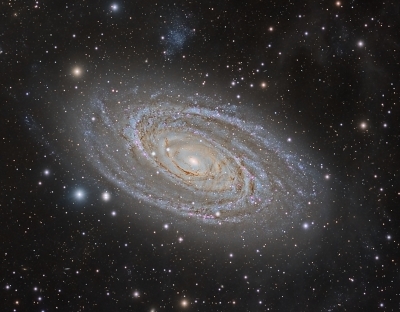 Top image is a close up view of M81 from the new TOA-150 image. Images acquired with CCDCommander (CCDSoft, The Sky & FocusMax) and, this time, entirely processed with PixInsight. The idea of this image started as a project in collaboration with Dr. David Martinez Delgado (Instituto de Astrofisica de Canarias). 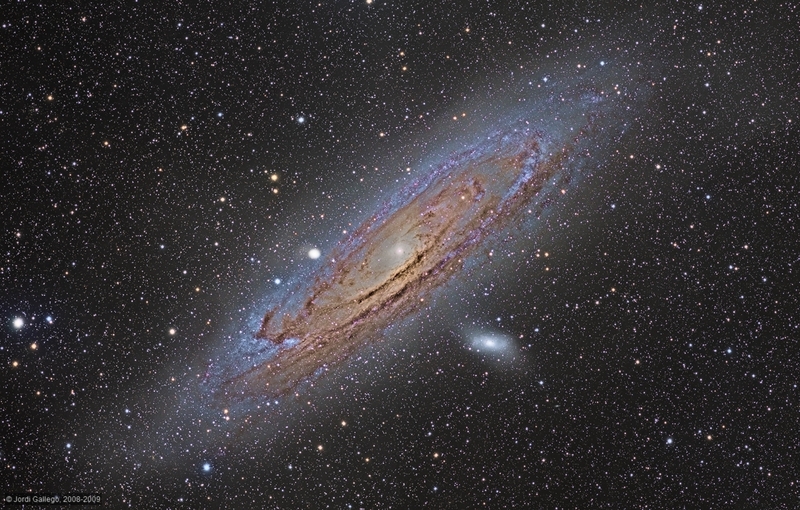 The main aim was to explore the sensitivity of my equipment in the detection of dwarf satellites and faint diffuse light features (mainly tidal streams from disrupted dwarf galaxies) around the Andromeda galaxy. The analysis of the data has showed that the FSQ+STL 11000 combination is an excellent equipment for exploring panoramic fields around nearby galaxies, providing results of scientific value. 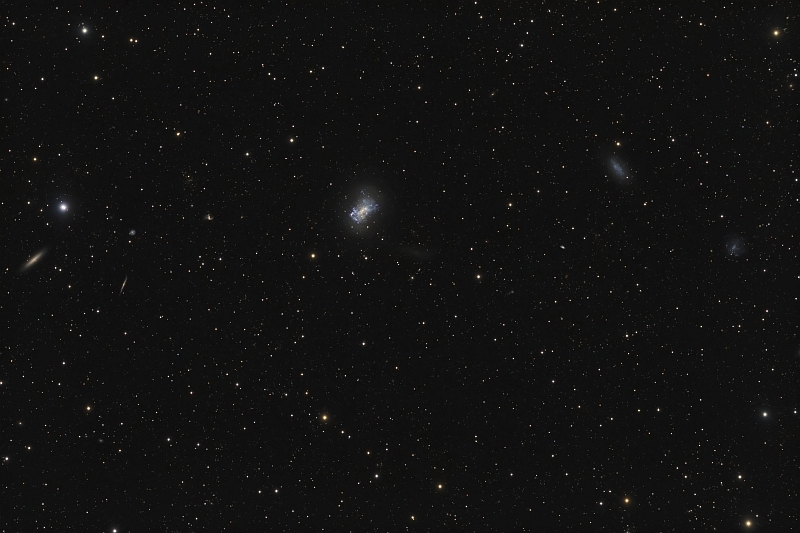 With this objective, I planned a mosaic of two frames that with my equipment covered a field of 7º x 5º. During the year 2008 I spent a lot of nights on this project acquiring a big quantity of luminance exposure. Altogether I have 13 hours of accumulated exposure on one of the frames and almost 12 on the other. I also took more than 100 short exposures (half minute or so) to get the necessary data to solve the core of the galaxy. 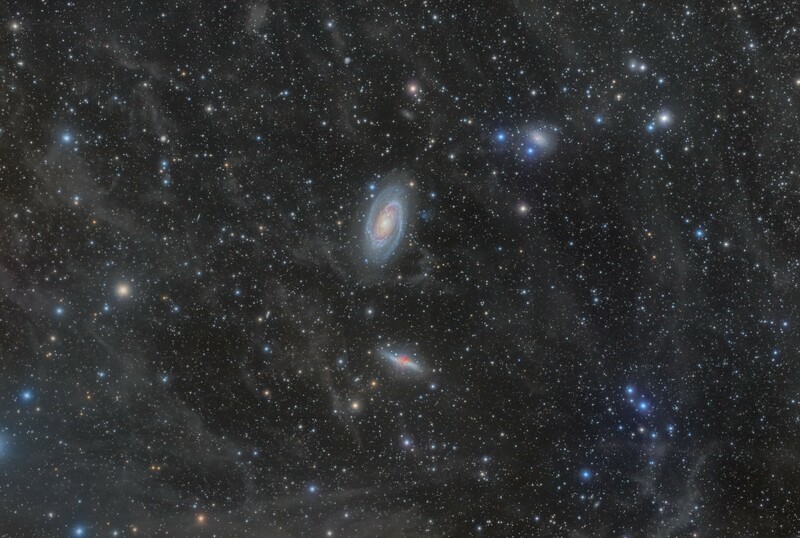 The luminance mosaic was composed with PixInsight, with its StarAlignment tool. This mosaic, in spite of only having two frames, it is a bit complicated to compose it well. In first place, because of the wide field extension and, secondly, because I planned a very small overlap area (7% only). PixInsight composed it very well, while other software packages produced both big field deformation and interpolation artifacts. In the year 2009 I was able to took color exposures (6 hours in total), but this time with the galaxy in the center of the field (no time for mosaics that season!). With that new color information I have composed this 2008-2009 LRGB image. - With the color addition in 2009, there is still a clear lack of chrominance to support the luminance. Although I increased the color saturation trying to improve this, the obtained colors did not satisfy me: for example Hydrogen alpha regions show salmon-pink color instead of red. - Some stars near the core show dark rings, as a result of a bad implementation (from my side) of the luminance deconvolution process. Anyway, all this work has allowed me to learn really a lot both from the mistakes I made and from the experimentation with new processing techniques. Unfortunately, even knowing that some more exposure time with an Hydrogen alpha filter would improve the pink color, and reprocessing the image from the beginning would eliminate the dark rings, currently I have no time to do it. So, for the moment, I will leave the image like this. Guide & camera control: CCDSoft. Processing: PixInsight. Please see more exposure details and a full resolution version of the picture in Gallery section. This widefield shot is centered on M78 (NGC2078), a bright reflection nebula within the Orion molecular cloud complex, but also includes NGC7129, NGC2067 and NGC2064 bright nebulae. This group of nebulae is about 1600 light years away from earth. The Orion molecular complex is one of the most active stellar formation regions that can be seen on the night sky. Pure RGB shot with TOA-150 and STL11k. Total exposure time is 11 hours, obtained in four nights on October and December. Images acquired with CCDCommander (CCDSoft, The Sky & FocusMax). Processing with PixInsight. 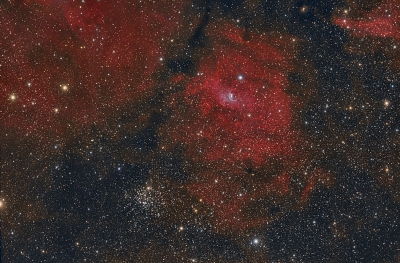 See complete exposure details and a higher resolution version of the widefield picture in Gallery section. 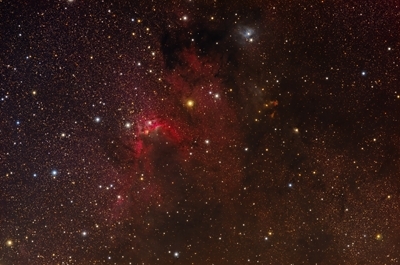 This widefield shot includes NGC7129, an open cluster in a reflection nebula (crop of the image at right), NGC7142, an open cluster and other dark nebulae in Cepheus. NGC7129 is an active star forming region that shows nice Herbig-Haro objects. 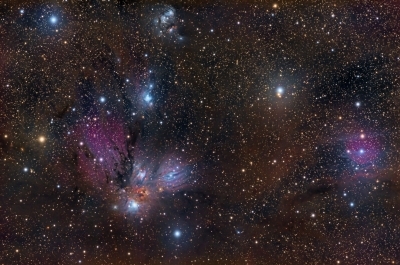 NGC7142 is about 6200 light years away while NGC7129 is only 3300 ly. RGB shot with TOA-150 and STL11k. Total exposure time is 10 hours. This is first image completely obtained with CCDCommander (working with CCDSoft, The Sky & FocusMax). Processing, as usual with PixInsight. 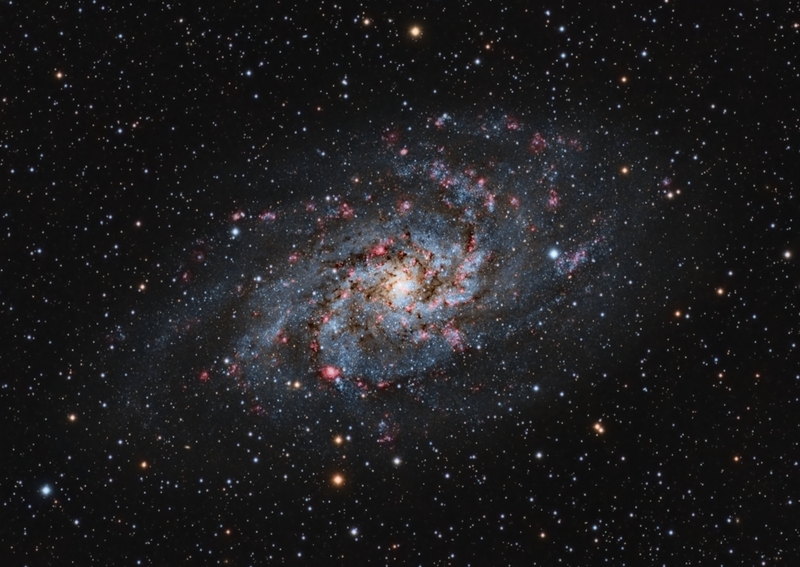 I have included a new web page with a few presentations and conferences on Astrophotography. You can download or read them in the Articles section. (Presentations are in Spanish language only). 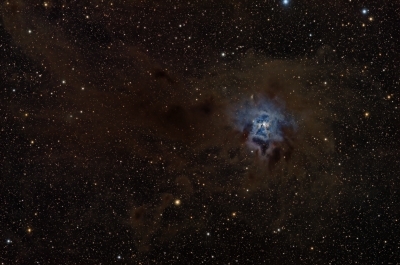 The Iris nebula, NGC7023, is a bright reflection nebula in the constellation Cepheus, about 1400 light years away. Its unusual structure of clouds of interstellar dust and gas really evoke the image of an iris flower. Whitin the nebula there is a hot and young mag 6.8 star that illuminates it. Although the predominant color is blue, you can find faint hints of red near the star, which is evidence of some hydrogen emission (you can see a close up view of the nebula in the Gallery section). This is again a RGB shot with TOA-150 and STL11k. After several tests, I feel very comfortable using this technique for relatively bright targets from Àger dark sky. Exposures were acquired during two unusually warm nights: temperature of camera had to be set to -5ºC. Please see complete exposure details and a full resolution version of the pictures in Gallery section. Cygnus constellation is a very rich nebula region. 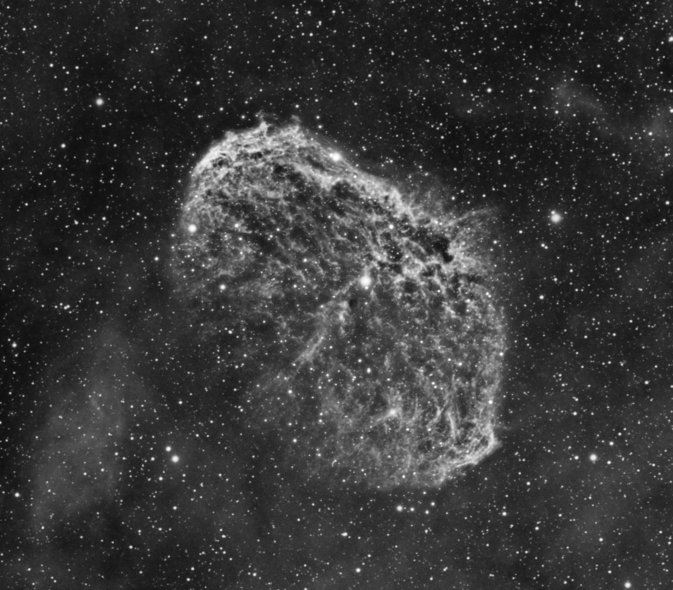 In the center of this Hydrogen alpha picture we can see NGC6888, also known as the Crescent Nebula. It is an emission nebula about 5000 light years away. The central star on the nebula is classified as a Wolf-Rayet star (WR 136). WR stars are massive stars which loose mass very fast by blowing off their outer layers producing a very strong stellar wind. It is thought that the complex structures of the Crescent Nebula are the result of the interaction of this strong wind with slower moving material ejected in an earlier phase. The end of life of most of WR stars is a supernova explosion. This widefield shot also includes PN G75.5+1.7, the Cygnus "Bubble" Nebula, a nice and pretty symmetrical nebula very recently discovered (Dave Jurasevich). This faint nebula may have been originated from the winds of a Wolf-Rayet star, as in the case of the Crescent Nebula, or it could be just a planetary nebula. H alpha shot with TOA-150 and STL11k. 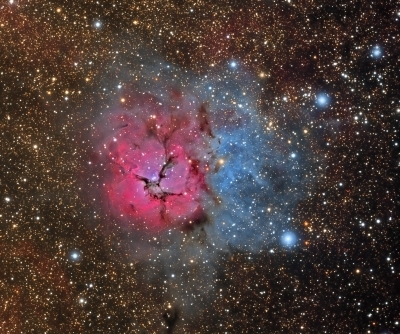 Located in constellation of Sagittarius, M20, the Trifid Nebula is one of the most beautiful objects in summer nights. It is a large and complex combination of a red emission nebula, a blue reflection nebula and a dark nebula (the lanes intersecting the red nebula) that gives the name to the object. RGB shot with TOA-150 and STL11k. Please see complete exposure details and a full resolution version in Gallery section. Located in constellation of Canes Venatici, M51 is one of the most famous spiral galaxies in the firmament and, with its neighbor NGC5195, is also a clear example of galaxy interaction. This is second shot with TOA-150 and STL11k, and I have chosen again to use only RGB data for this image. Guide & camera control: CCDSoft. Processing: PixInsight (new release 1.5). Please see complete exposure details in Gallery section. Click on the image for a higher resolution version. Well known and nice group of galaxies, located in constellation of Leo at about 30 million light years. This is first light of recently acquired Takahashi TOA-150 triplet apochromatic refractor. It is equipped with dedicated flattener 67-FL giving a focal length of 1090 mm at f/7.3 and an imaging circle of 90 mm. It is also first shot with new set of RGB Baader filters. 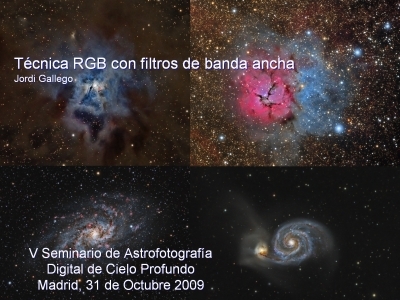 I am very satisfied of first contact and result of these filters, and of course of shooting at 1:1:1: !! Please see complete exposure details and full resolution version in Gallery section. Click on the image for a 50% version. 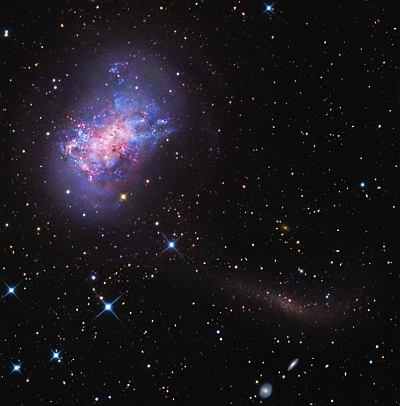 The spiral galaxy M33, also known as Triangulum Galaxy, is a member of our local group. Located in the constellation that gives it its name, is approximately 3 million light years away. This image is a R(R, Halpha)GB composite, with almost 9 hours of accumulated exposure: 4 x 30 min sub exposures for Hydrogen alpha and more than 6 hours of RGB data (9 x 15 min R, 9 x 15 min G, 7 x 20 min B sub exposures). Please see complete exposure details and full resolution version in Gallery section. Click on the image for a 66% version. Beautiful nebula complex of hydrogen gas and dust, located in Cepheus. Within the nebula we find the well known Elephant Trunk Nebula. This is a Hydrogen Alpha image taken with an Astrodon 6nm filter: 90 minutes of accumulated exposure (3 x 30 min sub exposures). As these were very late exposures and there was bad whether, I had no opportunity to add color exposures: color information will wait until next season. 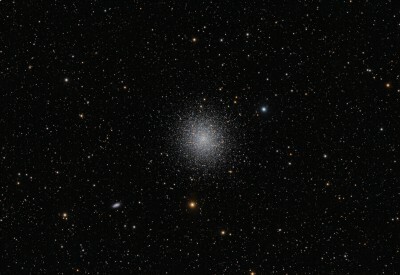 Preliminary color version of previous H alpha luminance image. 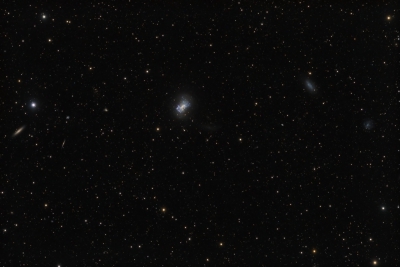 This is a L(Halpha) RGB composite, with 5 hours of accumulated exposure (10 x 30 min sub exposures) for luminance and 4 hour of RGB data (15 x 5 min R, 13 x 5 min G, 14 x 8min B sub exposures). This supernova remnant region has always atracted me. To properly catch the thin filaments is really a challenge. Last year I imaged it with my Canon 20Da but I was not satisfied by the result. So this year I tried again whit the STL11k camera. 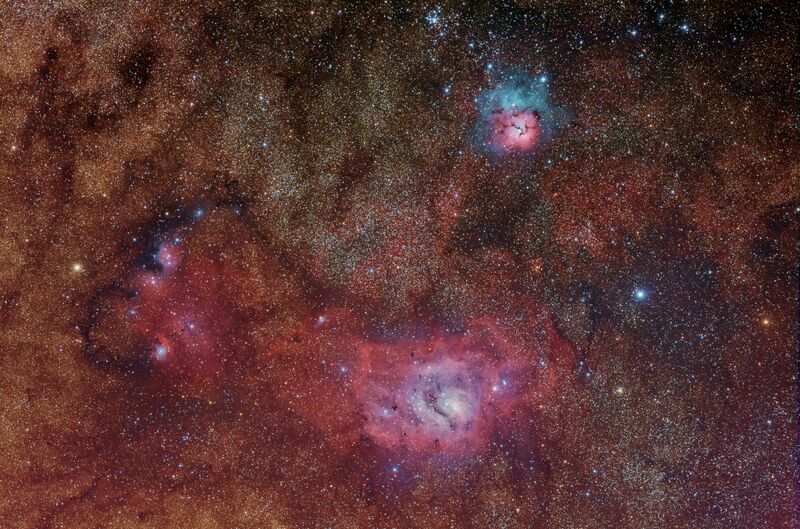 Incredibly rich region on the Milky Way in Sagittarius. 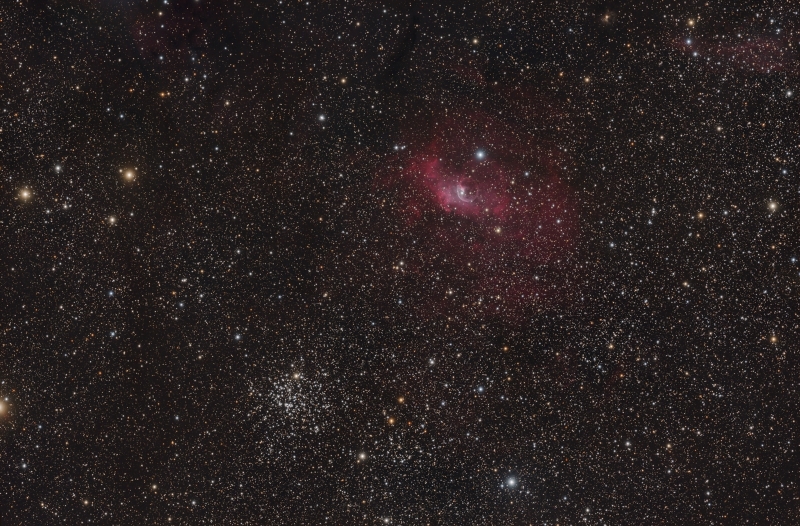 This widefield image was taken in three different nights between June and July, with the FSQ and the STL camera. Please see complete exposure details in Gallery section. Click on the image for a full resolution version. 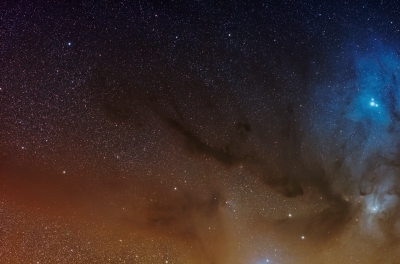 This year I planned a 4 frames mosaic on the Rho Ophiuchi area. After two months of bad weather during weekends, I had collected only a small part of the necessary exposure time. I also realized again that South view from my observatory is not the best of Ager sky: I found terrible gradients. Because of all this, I decided to stop the project. R = 9x8 min, G = 8x10 min, B = 6x12 min. Guide & camera control: CCDSoft. Processing: PixInsight . Click on the image for a higher resolution version. Next year I will try to take up again the project, but either incorporating an IDAS LPS filter directly mounted in the FSQ or using a Canon EF 200 f/2,8 L lens instead of the FSQ. Integrated Flux Nebulae (IFN) is the term coined by Steve Mandel to describe these dust clouds illuminated not only by a single star but by the integrated visual and UV flux of all the stars in the Milky Way. 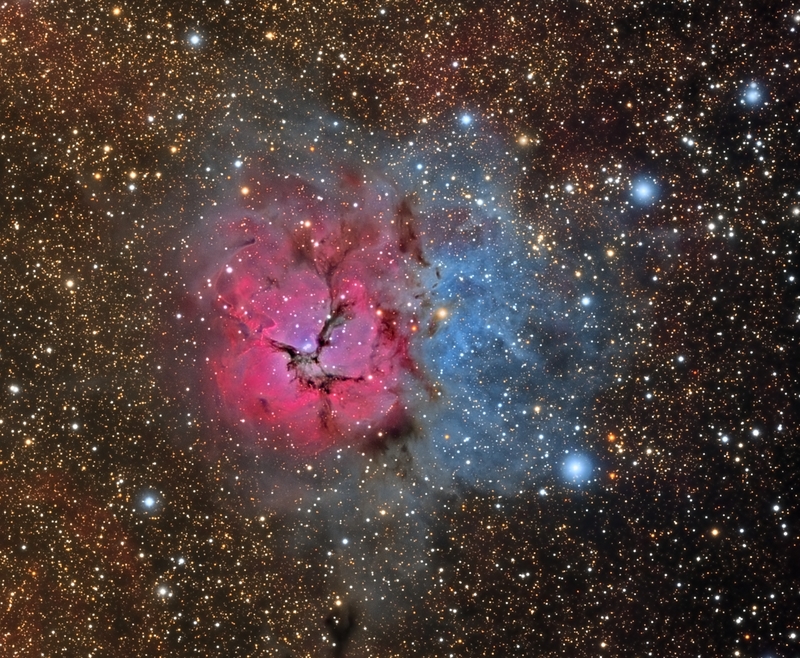 More information can be found at Unexplored Nebulae Project by Steve Mandel. 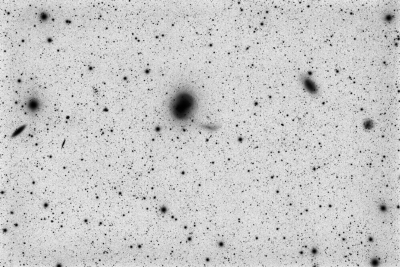 While I was starting to use my new STL-11k camera I accumulated 12 hours of exposure for three months, in order to show up the IFN but trying at the same time not to overexpose the bright Galaxies.